It was a year of events. It was a year of political rallies. It was a year of calamitous occurrences, tragic losses as well as a year of achievements and progress. TONY MATHIOT takes us back to that momentous year in our history. The year 1967. And it started with the usual torrential seasonal rains. On Saturday January 7, Victoria recorded 128.3mm (5.04 inches) of rain). This was a prelude to sustained periods of rainfall which soaked our colony regularly during 1967. The total rainfall in Victoria in 1967 was 100.28 inches, which was above the annual average of 92.62 inches recorded for the last previous ‘67’ years. However, some hundreds of visitors got to marvel at the resplendence of our tropical beauty. For the first three months, 3 luxury cruisers arrived in Port Victoria. Regina Marison January 30, Andes on February 14 and Caronia on March 4. Earlier in January, the Seychelles Bulletin had carried the headline Tourism: A major industry that Seychelles must have! After all 1967 was International Tourism Year. The imperative mood of the headline was a foregone conclusion since the British Government had already decided to build an airport on Mahé at an estimated cost of £4,500,000. In the meantime, ships of the British India Steam Navigation Company, the Shipping Corporation of India and those of the Royal Interocean Lines kept Seychelles regularly in contact with the outside world. A 10-day strike in February by workers of the Seychelles People’s United Party (SPUP) represented a loss of approximately 3,000 man days, which led to a Board of Inquiry being set up to deal with that dispute. Wage increase was the most common reason for strikes during 1967 and during that year, about 2,000 individual minor disputes were dealt with by the Labour Department. The economically active workforce at that time amounted to about 10,500 men and 6,500 women. Estate Labour employed about 3,700 workers. The population was approximately 49,000. The national budget for 1967 was R17,355,166. (This year’s national budget was R7,796,480,879). The biggest portion - R1,867,038 went to the Education Department and the legislative council got the smallest portion - R16,933. In 1967, Seychelles earned R10,517,737 for its domestic exports (copra, cinnamon and vanilla), with the copra bringing the most revenue - R5,557,477 for 6,188 tonnes. Since coconuts were the most lucrative of our products, the campaign against the melittoma coconut-trunk borer that had begun in 1960 was continued. The campaign eventually disclosed that there were then a total of 659,779 palms on Mahé. In the early 1930s, our coconut plantations were so infested with scale insects that the government had to seek the expert assistance of an Irish entomologist Desmond Foster Vesey Fitzgerald (1910-1947). He arrived in 1936 with 3 species of ladybirds which fed on the scale insects thereby saving the economic mainstay of our colony. The Seychelles Copra Association (est. 1953) sold its first ever sale to Israel - 800 tonnes for £65.5 shillings per tonne. In 1967, we exported 2,464 tonnes of cinnamon bark for R3,002,790.25, tonnes of cinnamon leaf oil for R331,088. Retrospectively speaking, it is amazing how many millions of rupees this most biblical spice (Revelations 18:13), (Exodus 30:22-25) which was introduced in Seychelles on 1772, contributed to our economy during the 21st century. In 1967, we earned R53,247 from the export of 1,556 kilos of vanilla. This was much less than the previous year (R174,890) on account of a high incidence of fungus infection which had killed a substantial area of producing vines on Praslin and La Digue, Consequently, there was a marked reduction in the vanilla crop. We imported 3,038 tonnes of rice for R2,037,296. Our revenue was R12,073,914. Our expenditure was R13,493,143. The Rochon Dam was being built. Some 200 men worked eight hours a day, blasting, excavating huge boulders, removing tonnes of soil for the construction of the 60ft, 11 ⅟2 million gallon capacity dam in order to provide Victoria with filtered and chlorinated water. Up at Bel Air, the residents gradually became accustomed to the sounds of pneumatic drills, sledge hammers and bulldozers. At that time, it was a construction project of an unprecedented scale, to be surpassed a year later by the construction of the airport. It was a year of jubilation for the Catholic Church of Seychelles. Two Seychellois priests made their sacerdotal debut. Father Edwin Mathiot who arrived on January 27 on SS. Karanja celebrated his first mass on January 31 for the Feast of St John Bosco. Father Jeremy Bonnelame who arrived on November 30, celebrated his first mass on December 8 for the Feast of the Immaculate Conception. There was much sadness as well. Sister Stephanie de Jesus passed away at the age of 56 years old on February 17 and Sister Marie des Seraphins Behe passed away at the convent of St Joseph de Cluny at the age of 92 years old on August 14, and History aficionados hailed the appearance of ‘Iles Seychelles, equisse historique’ by Father Louis Dayer(1911-1977). The meticulously researched ‘ouvrage’ remains a popular sought-after work of reference for those who wish to learn about the history of the Catholic Church in Seychelles, and more. 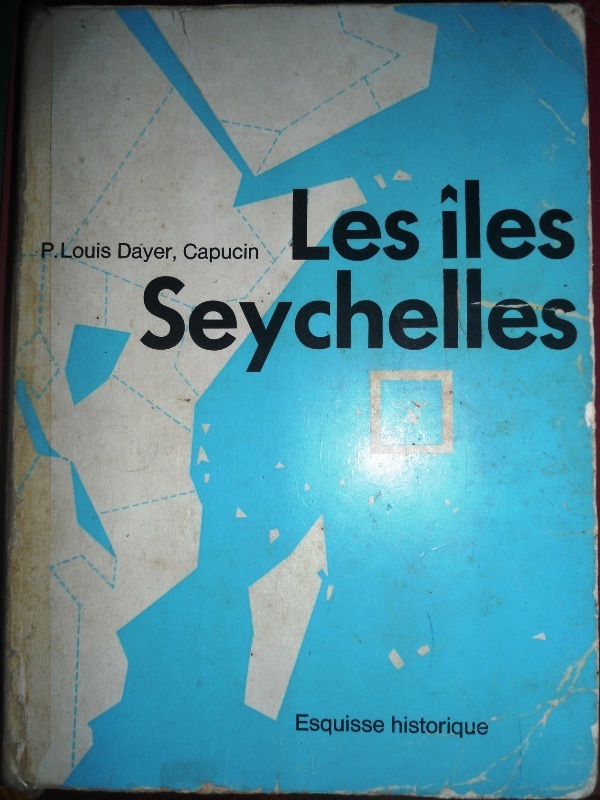 Father Dayer arrived in Seychelles in November in 1945 and left in 1973. During his time in Seychelles, he was the Parish priest of Baie Ste Anne Praslin and Anse aux Pins. In 1967, the Taxi Stand was being enlarged at a cost of R17,000. At the Seychelles College, the squash court was being built and in Victoria, the SHELL service station was being built at Esplanade. In May, three labourers were seriously injured when a wall fell on them. A week later, one of the three, Georges Mein 53 years old died on May 10 at 6.15pm at Seychelles Hospital as a result of his injuries. Up, in the forests of La Misère, the Fairview Estate was created when a group of exceptionally enterprising persons including Marcel Petit bought a large piece of wild scrubland and created residential plots. And Mahé Trading premises on State House Avenue was being converted into Victoria’s first supermarket. On July 7, a significant landmark in the colony’s sport history was achieved. At a meeting which was held at the Seychelles College a new organisation to promote and encourage amateur athletics in the Seychelles was formed. It was called the Seychelles Amateur Athletics Association (SAAA). The first President was Brother Austin O’Donell. It organised its first open cross-country championship on August 9. It was won by Philip Louange, a 14-year-old pupil at Seychelles College. He completed the 4 course from the College to Sans Soucis and Saint Louis, finishing at Gordon Square in 30 mins 13 secs. Our septuagenarian folks would remember the Measles (Larouzol) epidemic of 1967. It lasted from June to November during which time a total of 7,719 cases were notified, of which 3,609 were children between birth-5 years. There were 25 deaths of which 16 were in that age group. Yes, it was a sad year. The Postal Department was an establishment whose indispensability then cannot be questioned. It operated as the central Branch of the Government Savings Bank and it operated the inter-island wireless telephone service between Mahé, Praslin and La Digue. The staff amounted to 27 including 18 postmen. During 1967, the Postal Department received from overseas 1,385 mails and 1,329 parcels. It dispatched overseas 362 mailbags and 25 parcel bags, totalling 3,327 bags. In all, 878,907 letters were dealt with during the year. The Postal Department earned R528,276.04 from the sale of postal stamps. The total revenue was R554,969.99. The total expenditure was R225, 183.69. In 1967, 365 persons were convicted: 334 men and 31 women. The nature of offences ranged from: Common Assaults (7 cases) Stealing (55 cases) Drunk and Disorderly Conduct (15 cases) Obscene Language (21 cases) Gambling (4 cases) and Arson (1 case). There were few cases of house breaking and stealing recorded in 1967. During that year, 186 persons were sentenced to prison, among whom 57 were first time offenders. The establishment of our Police Force was 409 including 196 constables. There were then 14 stations. The total number of offences reported during the year was 4,639 including 644 traffic offences. During that year, there were 381 road accidents including 4 fatalities. There were 1,346 vehicles using the road. As for the Police Force it was equipped with 6 Land Rovers, 1 Bed Ford Truck, 1 Van, 7 Motor Cycles, 2 Mini- Mokes and 1 Fire Engine Land Rover. A police officer was required not to be less than 5ft 6 inches tall. A newly enlisted police officer earned R138 per month, with regular annual increments, free housing and paid leave. Have your elder folks ever told you that 1967 was the year of the “Back pay”? That was because the effect of the wage increases for the Government Labour Force, made retrospective from May, 1966 was not felt until the end of 1967 when the awards were implemented. In the private sector, employers in the building and construction industry followed the Government’s lead and some increases were made in the commercial sector. In an endeavour to control the rise in the rat population, the Victoria District Council organised campaigns in 1967 entitled “La Ronde des Rats” when prizes were given for the three highest number of rat tails produced by an individual and 20 cents paid for each rat tails produced. The campaigns which took place in August and November produced a total of 81,865 rat tails! There were also prizes for illustrated poems on the anti-rat theme. First prize (R20) went to Alwyn Talma aged 15 years old of Seychelles College and second prize (R10) went to Daniel Belle, 14 years old, also from Seychelles College. On April 7, the Governor Julian Edward George, the Earl of Oxford and Asquith (1916-2011), departed from Seychelles after serving as the colony’s Governor and Commander-in- Chief since January 27, 1962. Sir Hugh Norman Walker (1916-1985) arrived in Seychelles on April 15 and assumed office as the colony’s Governor and Commander-in-Chief. He was sworn in by the acting Chief Justice Louis George Souyave (1926-2004). 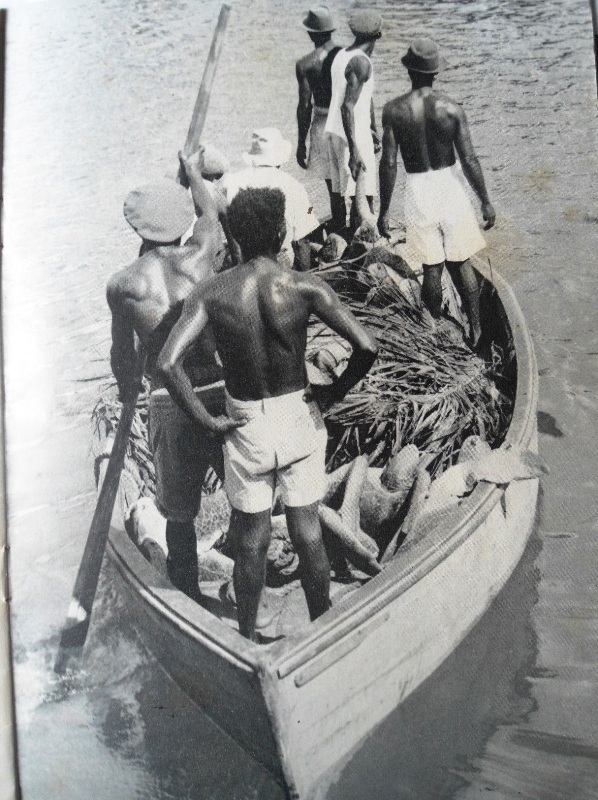 On April 18, Seychelles received the visit, yet again of Jacques Yves Cousteau (1910-1997) who arrived on the Calypso. He had already visited Seychelles twice in the 1950s. Cousteau was the famous french underwater explorer whose 1956 film ‘The Silent World’ documented the extent of his oceanographic research. It consisted of 25 kilometres of film made over a period of two years in the Mediterranean Sea, the Persian Gulf and the Indian Ocean. The movie is actually 1h 26 mins duration. Entertainment..? Well, residents of Victoria had quite a few occasions to experience some cinema thrills. “Behold a pale horse” starring Gregory Peck and Anthony Quinn was shown at La Salle D’Oeuvres (the actual Deepam Cinema). 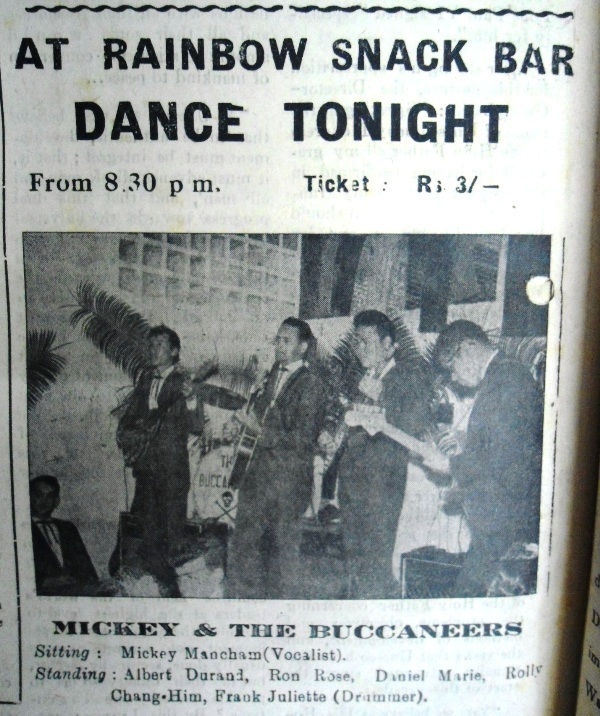 Mickey and the Buccaneers played at Rainbow Snack Bar (on the second floor of the Creole Holiday building) on Saturdays. Mickey Mancham (1944-1970) was the younger brother of the First President of Seychelles, Sir James Mancham (1939-2017).Those who had record players in their homes listened to records that had been released in 1966 because it took a while for those vinyls to get here. In 1967, you would have heard ‘Monday Monday’ by the Mamas and Papas, ‘Sunshine Superman’ by Donovan, ‘Sloop John B’ by the Beach Boys and ‘Yellow Submarine’ by the Beatles. Thirty-seven ordinances were passed during 1967, among which were: Control of Hire Craft Ordinance, Industrial Development Ordinance, and Right of Access to Islands Ordinance 1967. 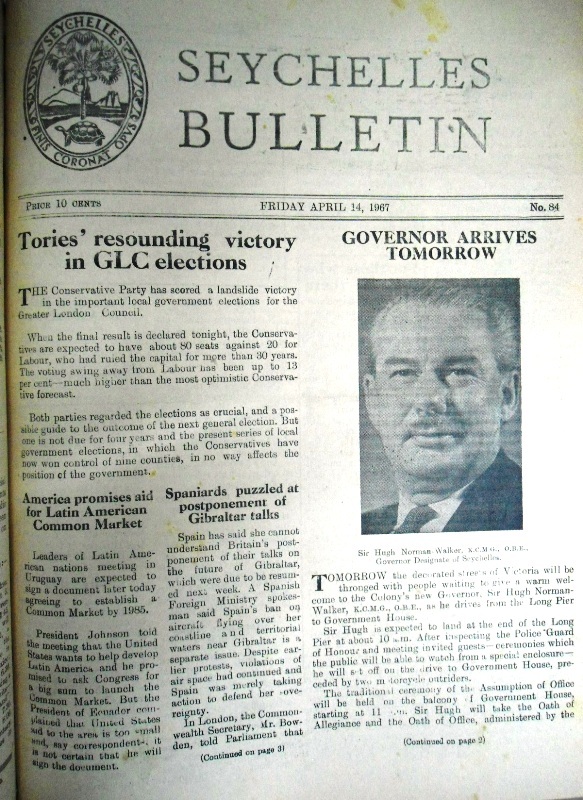 It was the year when our first ‘Constitution’ was introduced - called the Deverell Constitution, after Sir Colville Deverell (1907-1995) an advisor appointed by the colonial office who visited Seychelles in 1966 to discuss political reforms regarding universal adult suffrage with the two existing political parties. The broad effect of the constitution was to associate the non-official members of the Governing Council much more closely with the day-to-day working of the Government through service on the committees of council which were responsible for formulating and implementing policy. The constitution was introduced in November 1976 and a General Election took place on December 12 in which men and women over 21 voted for the first time. Eight candidates were returned, four of them members of Seychelles Democratic Party, three Seychelles People’s Party and one Independent. There was much election fervour during the latter half of 1967. And you know what, that year’s calendar is actually the one we have lived through during 2017. So yes, we’ll have a Monday Christmas, just like Christmas 1967. Was it the year you were born?